What Day Of The Week Was January 8, 1994? 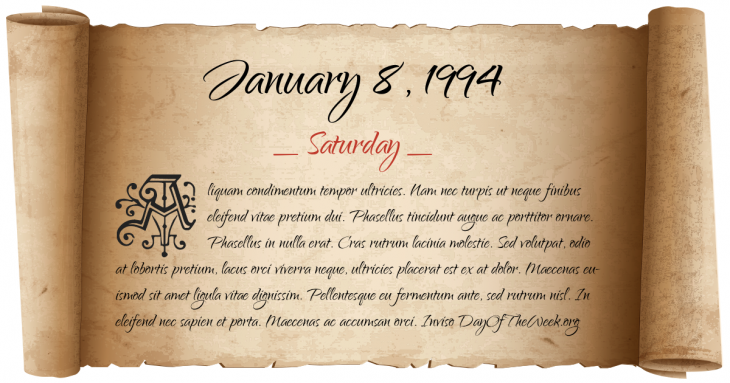 January 8, 1994 was the 8th day of the year 1994 in the Gregorian calendar. There were 357 days remaining until the end of the year. The day of the week was Saturday. A person born on this day will be 25 years old today. If that same person saved a Dime every day starting at age 4, then by now that person has accumulated $777.30 today. Russian cosmonaut Valeri Polyakov on Soyuz TM-18 leaves for Mir. He would stay on the space station until March 22, 1995, for a record 437 days in space.